Go to the top of your web page when on the ebay site and the item, hit copy or select, select all, copy and then paste the link here. There are tutorials on how to upload photos on here just go to the search engine and look up posting pictures. Wow. I live in Byrd's hometown. Pretty cool to see this. Hmmm...I guess the seller doesn't know he could end up using all his money from the sale of this group for his lawyer fees?? His MOH got sold by Sotheby's back in 1988 along with everything else by his family. I know where some of his medals are. A very prominent collector bought all of this Federal medals in at auction back when it was legal and kept them together minus the early sharpshooter badge. Are you sure the medal at VMI is the original? The one in the Sotheby's catalog sure looked like the real one to me and it was engraved properly. 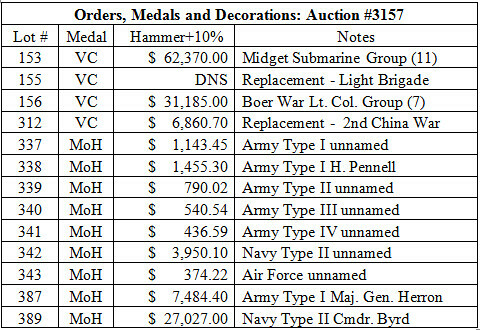 Here is the price realized list for some of the lots in that auction. Byrd's MOH sold for 27K then. Edited by KASTAUFFER, 09 October 2018 - 04:46 PM. Truly amazing group, and I won’t be surprised if he gets pulled before it ends. Would be nice to see what it would sell for now. Makes you wonder how many bids are real? Simply because most people don’t think it will make it to the end. Was there some sort of controversy over the original sale? Fighting the Feds over buying a MoH. Gotcha - I didn't look closely enough at the pictures! I wonder if a resident US collector is going to end up with these, either through his own bidding or a foreign straw-man. Either way, risky business since the FBI is probably all over this one, and I would not be surprised if they use their toolbox to fully check out where it ends up, assuming they are still enforcing the asinine law. Sad thing for a US collector, even if he gets away with it and ends up with them, unless he's prepared to go to the mat and put up the war chest to challenge the asinine law (or roll over and lose the "contraband" and hire a lawyer to plea bargain), he won't have bragging rights or be able to show and tell, except to trusted confidantes. Edited by aerialbridge, 10 October 2018 - 06:49 AM. Not to beat a dead horse but the seller could face the same fate.Just hope it doesn't happen for either party. My guess is the FBI would only be interested if this was a full sized medal. Ribbon bars and a miniature medal may not be high on their list. The photo in the auction looks interesting...I don't recall selling it though! Edited by warpath, 10 October 2018 - 08:23 AM. I second what Kurt mentioned. In past years, the FBI has been very lenient towards ribbon bars so I think this one will be alright, but I may be proven wrong. As far as the miniature, I know of no case where there has been any issue with those. The listing says, "We were able to find a photograph on line showing Admiral Byrd wearing this very set of 9 medals, which you see in our auction." They should have said the photo is not included.